The focus has shifted to our western neighbours in Pakistan for the third edition of the Border Movement Lounge in India, which is set to take place on 18 March in New Delhi. The event will take place at Goethe-Institut / Max Mueller Bhavan and will feature performances by Karachi based electronic savant TMPST and one of the most capable new outfits we’ve seen in a while – Else if. Border Movement has in recent times hosted some very successful workshops and events in the country, including the intensive SoundLabs (here’s a recap of the most recent one in Mumbai) as well as the BM Lounge, which focus on a different area of South Asia each time and have featured the likes on Bangladesh’s Space/Ghost and Sri Lanka’s Sunara in the past. TMPST is the musical alias of Asfandyar Khan, one of the most widely talked about Pakistani electronic musicians right now. His music ranges from lush, ambient spaces to bass and 2-step garage with earworm beats and chopped up vocals. Inspires by the likes of minimal, ambient pioneers like Brian Eno and acclaimed producers such as Eluvium, TMPST’s music gives us the perfect insight of the small but effervescent experimental electronic space in Pakistan. Supporting TMPST is Delhi based musical duo ‘Else If’, whose performance at the Magnetic Fields festival blew us away. G “Force” Arjun & Puneesh Suri are inspired by the sounds around them and use rich instrumentation alongside electronic beats and nautical basslines. Else If will be making their Delhi debut at the BM Lounge. This particular edition is associated with SURGE, the PIX: Pakistan exhibition. PIX is a photography quarterly that explores various aspects of our reality through the evolving medium of photographs, and centres around a new theme every time. The event, which is the first edition of PIX that lays its foundation in the territory of Pakistan, will begin with an illuminative, curated walk through the photography exhibition. 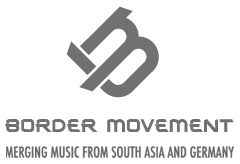 Follow Border Movement’s website for an insight into the music of South Asia and follow them on Facebook for updates. Keep and eye out on our website for more information.